Home / News / THAILAND: MILITARY COUP – The right man for what job? THAILAND: MILITARY COUP – The right man for what job? When General Sonthi Boonyaratglin led the armed forces of Thailand to overthrow the caretaker government of Pol. Lt. Col. Thaksin Shinawatra on September 19, the military indicated that it would withdraw from politics within two weeks, having set in place an interim constitution and premier. Interim constitution and premier are now there as promised. And predictably the military has not withdrawn from its political role. The interim constitution secures the power of the coup group while trying to give the opposite impression. As informed observers have already noted since it was announced on October 1, the charter gives the remodelled junta authority of appointment and decision making over the heads of any new government. Apart from appointing the prime minister, and chairperson and deputy chairperson of the temporary parliamentary assembly, the junta will appoint a 2000-member body which will select 200 persons from among its ranks, among whom the generals will again select 100, who will be responsible for setting up a 35-person constitution drafting group, among whom 25 will be drawn from the 100 and ten will be handpicked by, yet again, the junta. Questions over the criteria and procedure for selection of the 2000, 200, 100, 35, 25, ten or whatever numbers of persons for whatever posts remain wholly unanswered, and largely unasked. All this pointless whittling down of persons in order to write a new permanent constitution is apparently intended to distract attention from the fact that it is the junta deciding who does what. It is also apparent that suggestions from law experts to make changes to the document while it was still in draft, which reportedly had as its main author the same person as the 1991 interim constitution, were ignored. It is not surprising that academics and other legal professionals have expressed grave concerns. Of section 34, which allows the junta to call the council of government ministers for a meeting in which to air its views any time it pleases, former senator Thongbai Thongpao wrote in his Sunday Bangkok Post column that it “is not very clever” as it “spoils the pledge of non-interference in the civilian administration”. A cartoon on the independent news website Prachatai put the situation more simply: the constitution drafting assembly is sealed off by a barbed wire fence; two ordinary citizens are left to cling to the fence and shout from the outside. However, expressions of doubt about the constitution and serious questions over its many omissions have been eclipsed by the admiration gushing from all quarters for the junta’s new prime minister, General Surayud Chulanont. The general, who has been defined as a “civilian” by virtue of his having not so long ago stepped down from the post of supreme commander after a lifetime of military service, is said to have accepted the post reluctantly. The media and others have fallen over themselves to unabashedly extol his virtues. He has been repeatedly described as “the right man for the job”, “a man of integrity” and having “impeccable credentials”. All of this emphasis on the person rather than the law greatly undermines the prospects for genuine constitutionalism in Thailand. The maintaining of law above government–not the other way around, as has been practiced in Thailand–depends upon effective institutions. Where institutions are functioning and trusted, they resist the incursions of individuals, good or bad. By contrast, where reliance is placed on the individual, order is maintained for only so long as a “good” person is in place, and even then without any guarantees. The experience of 1991 is instructive. When a junta then appointed Anand Punyarachun as interim prime minister, he too was widely welcomed and lauded as the “right man for the job”. A diplomat and businessman, not a military careerist and personal friend of the coup leaders as in the current events, Anand worked assertively in the public interest. However, ultimately he too was unable to prevent the military from obtaining a constitution that reaffirmed its political role and paved the way for the coup leader to become prime minister, resulting in the protests and bloodshed of May 1992. Only subsequently did lengthy discussion and struggle lead to the 1997 Constitution and with it some hope for the building of lasting institutions that might become the foundations for the rule of law in Thailand. This hope was greatly damaged by Pol. Lt. Col. Thaksin and his government; however, it took the army to destroy it completely. 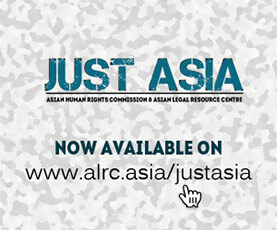 The Asian Human Rights Commission asserts that under the new interim constitution there is no right man for the job. What job is it that can be performed under this temporary charter other than to comply with the junta? Who will perform this job other than persons appointed by the generals? What sort of permanent constitution can be expected other than one that meets the objectives of the military? The notion that any of this will “strengthen [Thailand’s] democracy in both form and content”, as claimed by one government mouthpiece, is absurd. The Asian Human Rights Commission calls for intense domestic and international discussion on the contents of this temporary charter and its implications for Thailand. It is this document, not the office of prime minister, which bespeaks the intentions of the junta and indicates the future of the country. It can and should be read in full: in English, http://www.mfa.go.th/web/35.php?id=17706 (Ministry of Foreign Affairs website); in Thai: http://www.thairath.co.th/promote/constitution/constitution.php (Thai Rath website).